The Campus Bookstore will be on site during Convocation to sell mementoes of the occasion, including these new 100 percent silk neckties, available for $42.95; $49.95 with the matching gift box. Like any investment, what you get out of university depends on what you put into it, says Katherine Vrantsidis. The 2016 recipient of the President’s Medal, she has dedicated herself in the classroom, in the research lab, in campus activities and in the community. The award recognizes a graduand who has made significant contributions to campus and community activities while maintaining a superior academic record. Vrantsidis’ cumulative grade point average of 93 percent earned her a Board of Governors medal for top standing among graduates of mathematics and statistics, alongside a record of achievement in a wide range of endeavours. Besides her coursework, she participated in several research projects as a member of the Outstanding Scholars program—including one with an industrial partner funded by the Natural Sciences and Engineering Research Council of Canada. She served as president of the Math and Stats Student Association since 2014; volunteered with Students Offering Support, a tutoring service that raises funds for education in Latin America; and worked with the Odette Toastmasters chapter to develop presentation skills for newcomers to the country through Women’s Enterprise Skills Training of Windsor. Vrantsidis was also active with Science Rendezvous and Let’s Talk Science, promoting the wonder of discovery to local schoolchildren. “It’s very rewarding to get kids excited about science at a young age,” she says. And her work as a member of the math departmental council helped her get to know faculty in her in field, even some she never had a class with. She says all her extra-curricular activities gave her skills that will be useful as she begins a professional career. As she prepares to cross the stage Tuesday afternoon, Vrantsidis reflects on how humbled she is to be receiving this recognition, and how proud she is to be graduating from the University of Windsor. 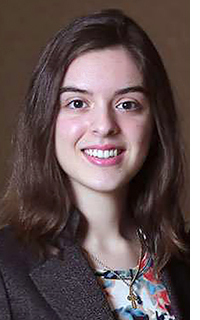 Rebecca Pillon, an honours graduate of the developmental psychology and criminology program, will receive the Governor General’s Silver Medal during Wednesday’s 10 a.m. session of Convocation. The award recognizes graduates of an honours undergraduate program deemed to be the most outstanding in their field in relation to their graduating peers.